Spurless Balsam is the commonest and probably the smallest flowered, almost spurless balsam of Himalayas. It is an annual herb 15-40 cm tall, branched, hairless. Leaves are elliptic-ovate to ovate, 2.5-14 x 1.6-7 cm, toothed, base glandular. Leaf stalk is up to 3 cm long, slender. Bracts are 1-2 mm long, lanceshaped. 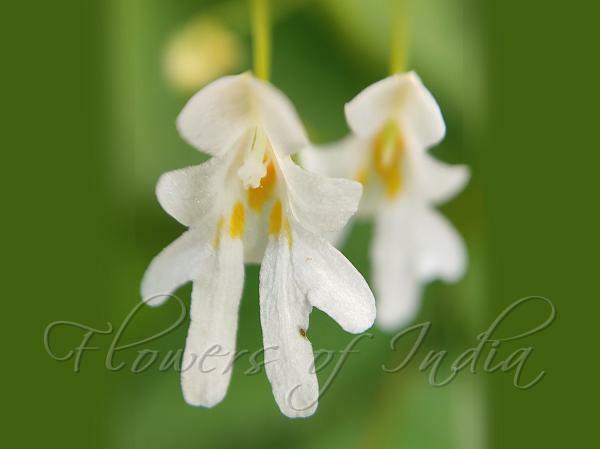 Flowers are white, 4.5-6 mm long; stalk up to 2 cm long, slender. Lateral sepals are ovate, about 1.5 mm long - spur is almost absent, only 1 mm long, sometimes tinged yellow. Anterior petal is circular-wedgeshaped, 3-4 mm long. Lateral united petals are 5-6 mm long, dissimilar - lower ones prolonged. Capsule are erect, cylindrical to almost club-shaped, 1.2-2.2 cm long. Seeds are 2.5-3 mm long, oblong, wrinkled. Spurless Balsam is found in C. Asia and W. temperate Himalayas, from Kumoan to Kashmir, at altitudes of 1900-3000 m. Flowering: July-August. Identification credit: Gurcharan Singh Photographed in Pahalgam, Kashmir.